The vast central chamber of the pyramid. An immense space. Holloway walks in, his flashlight searching. Watts hurries after. The others follow, rovers tagging along. A colossal structure stands in the center of the chamber, convoluted and strange. A mechanism. Chasms yawn in the floor all around it, their depths lost in darkness. The core chamber brightens as the sun outside moves into alignment. The shaft of light perfectly centered. A vast SIGH as if the pyramid itself is breathing. A fat drop of water falls on Watts’s glove. She looks up in surprise. Another falls on her visor. And then it’s raining inside the pyramid. Water trickles into the chasms, inundating the mossy growths that cling to the walls. 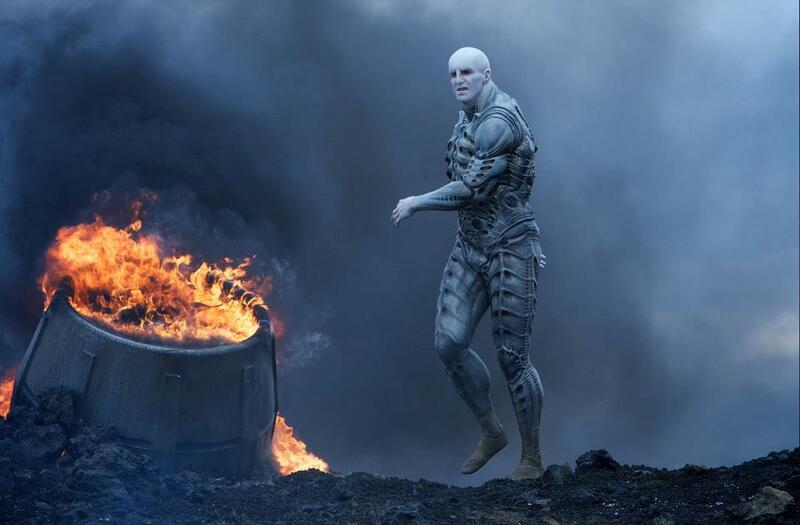 Damon Lindelof’s Prometheus script removed the air processor and replaced the sequence with the ampule room. 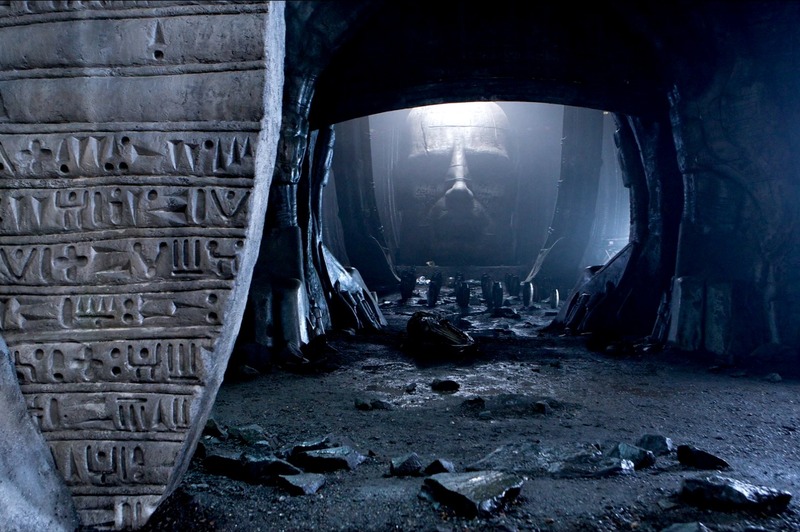 Notably, there is no giant head in the script (at least not in the version that leaked – there seems to be no ‘Ridleygrams’ of it either), though there is a wall of ampules, “rows and rows of them.” The room’s exposure to new air causes the ampules to ‘sweat’ as they do in the movie, but they also topple and pop open and shatter in the screenplay. 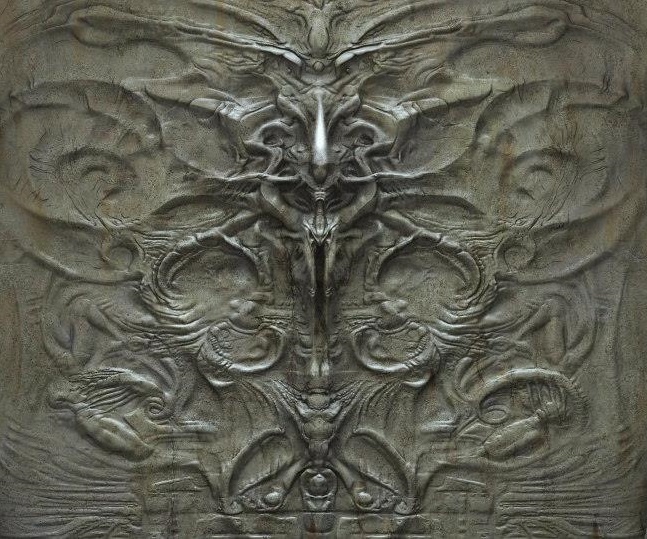 Before the film’s release it was stated that HR Giger had designed a set of frescoes for the film. Fans were understandably excited and subsequently confused when his artwork did not appear. The exposure of the pyramid’s insect life to the mutagen is more dramatic in the script. “We see several small centipedes that came in from outside skittering away as the liquid washes over them.” These centipedes mutate into the Hammerpede creature. Worms replace the centipedes in the film. The monolithic head, once rumoured to be the pilot of the Juggernaut ship, seems to testify some sort of blank, terrible power. Whether it signifies a god, a particular Engineer, or the Engineer race as a whole, we don’t know. 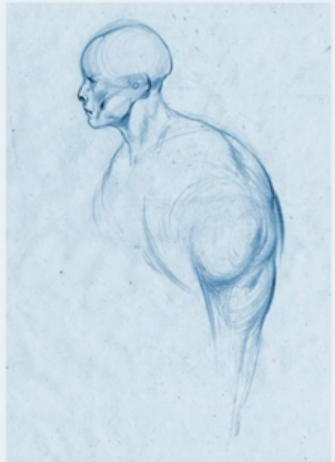 Before the film’s release the giant head was rumoured to pilot the ship, and was imagined by fans as being a living, bodiless and biomechanic intelligence – a sort of riff on the legless, sessile Space Jockey seen in Alien. In the film it instead silently looms over the ampules in a chamber described as both a vault and a chapel. The head is inscribed with glyphs on its front and sides. One idea thrown around production was to have the Engineers bearing facial tribal tattoos. The glyphs on the giant head resemble the alien language inscribed on the structure’s walls, doorways and on the deadly ampules. Ethiopian statue of Benito Mussolini, and the Engineers’ ‘God-Head’. Testaments to power and worship. Mussolini was gunned down, hoisted to the girder of a garage, and his corpse pelted, shot, and spat on. As Percy Shelley wrote in his poem Ozymandias, great and terrible leaders die, and the monuments to their reign topple and crumble, left to gaze over a buried empire. The legacy of the Engineers has fared no better. 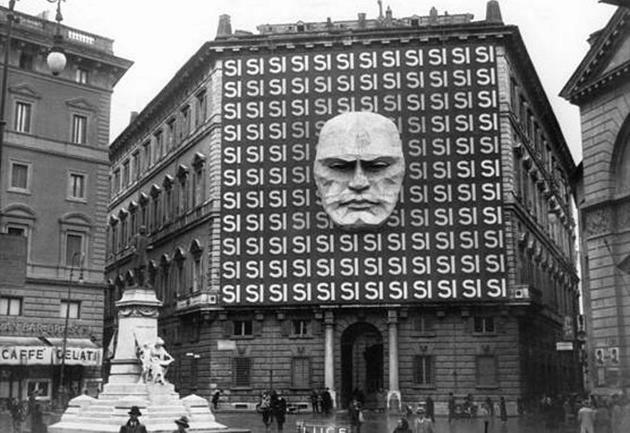 Billboard for the 1934 parliamentary election for Benito Mussolini and the Italian Fascist party, taken in Rome. 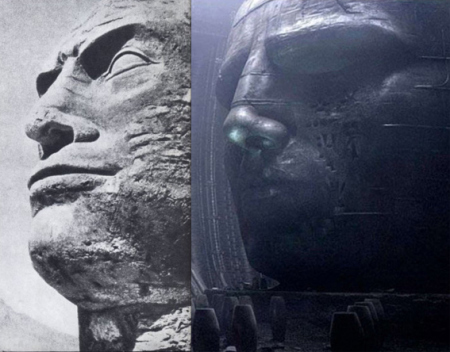 The Engineer head monument is an allusion to worship and power, perhaps even fascistic power. A giant head featured in John Boorman’s Zardoz (1974). 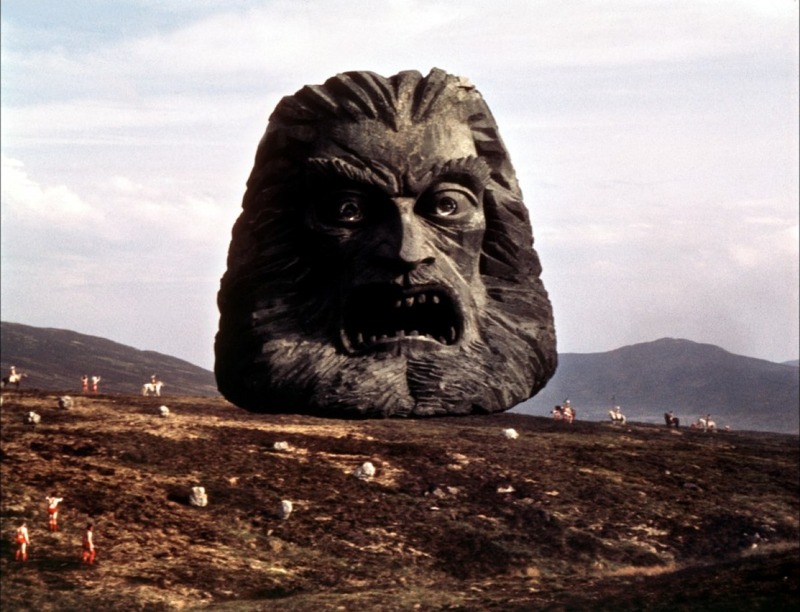 Zardoz, a godly being, teaches that human procreation is an evil, since it results in the propagation of man. War is good, since it cleanses the world of men. There is no direct correlation between Prometheus and Zardoz, but these common elements are intriguing enough to merit a mention. 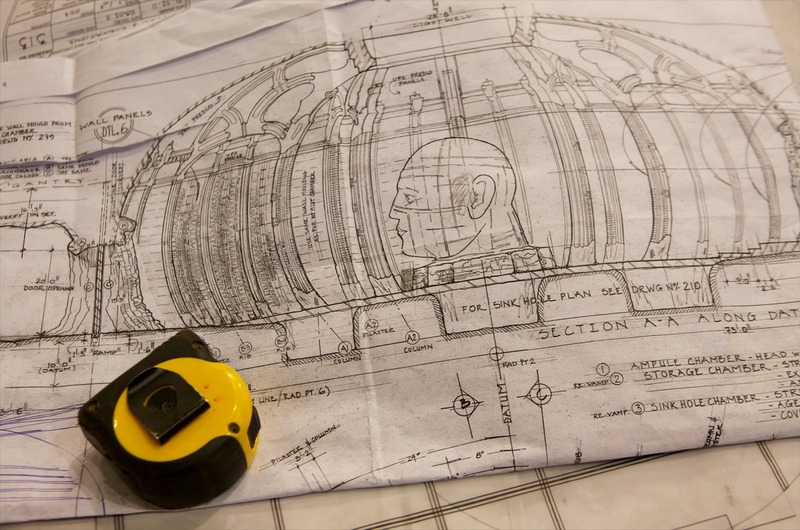 One of the chamber’s more interesting elements is the Alien mural that lies at the far end of the vault, behind the Engineer head. ~ Steven Messing, i09.com, 2012. Holloway notices a small altar before the Alien mural. Atop this altar is a jade crystal – in the film’s trailers the crystal does not appear. Instead, a bowl like the one the Sacrificial Engineer drinks from in the film’s opening takes its place. Ian Whyte is a former basketball player who first appeared on film screens as the lead Predator in Alien vs. Predator. He resumed his role, albeit as a different Predator, in Aliens vs. Predator: Requiem. Other film roles include lending his services as a stunt performer for Harry Potter and the Goblet of Fire, playing a djinn in Clash of the Titans, a fiery sword-wielding representative of Satan in Solomon Kane, various roles in Game of Thrones, and the Engineer in Prometheus. Valaquen: It seemed like you jumped right into the deep end with your first role, playing the iconic Predator in a long awaited movie. How did the role come to your attention, and what did the audition process entail? Ian Whyte: The casting director called my basketball team who then called me to pass on the news. My initial reaction was, “Yeah right! Nobody wants to put me in a film!” but within five minutes I had been invited to London to audition for the part. I was asked to put on a wetsuit, a balaclava, a rough mock up of the predator head with thick black ropes for dreads and the predator mask. When fully dressed I was given the command: “Start running!” and I went around and around in circles, in the studio on what was the hottest day of the year for about an hour. I briefly met Paul Anderson the following day. A week later I was invited to Prague to meet the ADI crew who had the final say on the casting and a week after that I received a phone call from the producer offering me the part… if I wanted it of course! V: The interesting thing about Scar, your character in Alien vs. 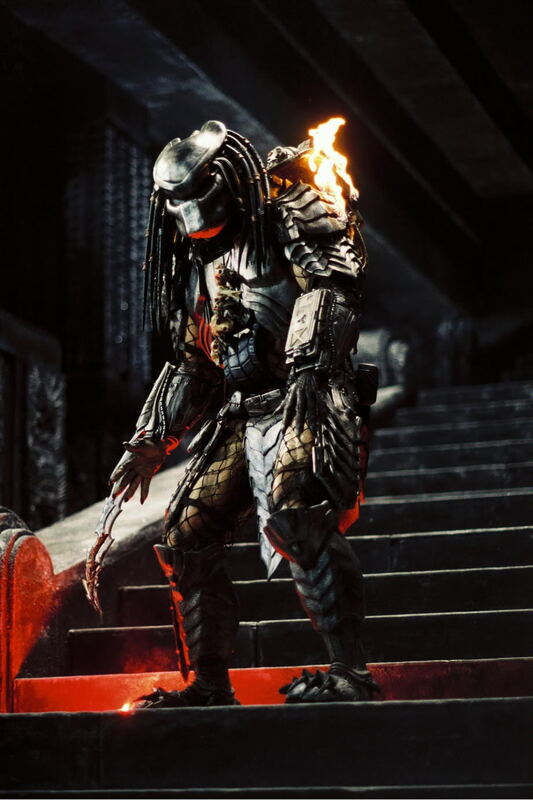 Predator, is that he kills human characters as well as the Aliens. Can you comment on working with (and killing) actors like Lance Henriksen? IW: I was very honest with the cast as to my experience in front of the camera and they were very gracious and very helpful when we were shooting the scenes, none more so than Lance himself. That scene was quite literally a baptism of fire. There was an experienced stuntman on hand to do the actual burn sequence when Weyland ignites his oxygen bottle, but I did the closeups. The shot that was used in the film showed some whisps of fire on my shoulders, but in quite a few of the takes I was quite ablaze! Before I left for Prague to shoot, my wife said to me, “You can do as many of your own stunts as you like, just don’t let them set you on fire!” and that was one of the first scenes to be shot as well! V: Aliens vs Predator: Requiem, wasn’t well received but your performance as Wolf earned you a lot of acclaim from fans. Some even compared you to original Predator performer Kevin Peter Hall. How did you approach the svelte professional Wolf in comparison to the bulkier amateur Scar? IW: I approached the role in much the same way with regard to my training, I just had a lot more of it! Three years passed between AVP and the sequel and I spent those years training as if the film was just around the corner. It was time well spent, because the shooting schedule crammed twice as much action into half the amount of time compared to the first one. One day the producer came into the studio and shouted, “Send Ian home! We can’t keep him here any longer!” I had just gone over 18 hours on set. 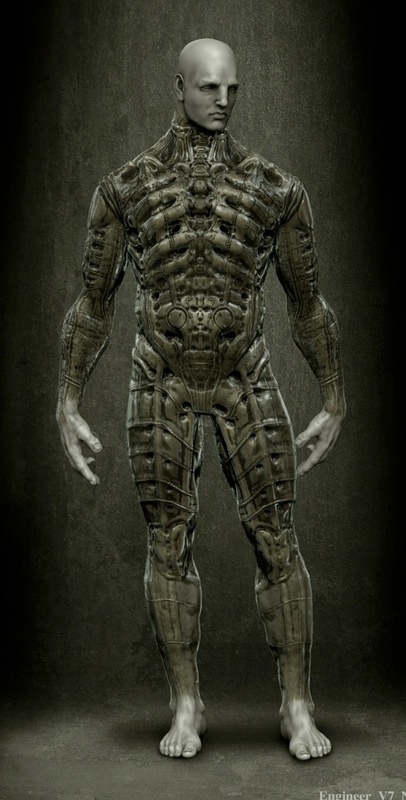 V: You also played the Engineer in Prometheus. How did this role come to your attention? IW: Very quietly! Initially I was just asked to do some makeup tests for the prosthetic makeup applications that the makeup supervisor was working on, but it very quickly became an ongoing audition of sorts. Then I met Ridley one rainy Sunday afternoon in Pinewood and quite soon after I met the casting director for an official audition. Without any irony whatsoever, the scene that I auditioned was the one scene in the script that I didn’t shoot for the film: the self sacrifice scene at the waterfall! 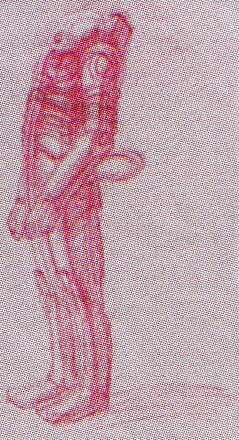 V: Unlike the Predator or the creatures from Solomon Kane and Clash of the Titans, the Engineer’s face is a large part of the performance: he is largely unmasked, and can emote. He also gets some dialogue. Do you prefer the sort of roles where you can hide under layers, or do you prefer roles like the Engineer, where the make-up does not disguise you completely? 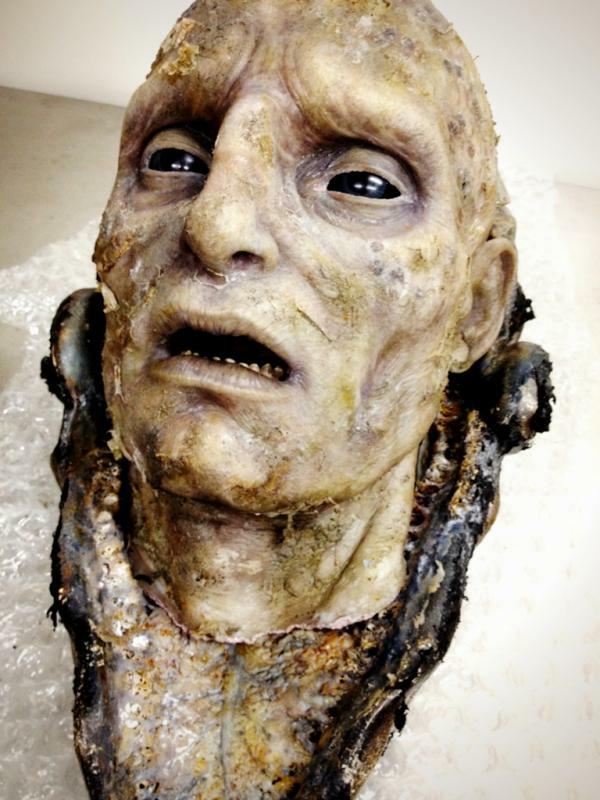 IW: A mask is a luxury for an actor that is true. You can completely let go of reality when the camera doesn’t see your face, but these are fantastical roles anyway, they require a great deal of imagination and invention to make them a “reality”. I tend not to discriminate between masked roles and straight roles, the emotions are all going on underneath the mask anyway and it’s me that’s moving the costume, not the costume that’s telling me how to act. V: The Engineer is a mysterious being. We don’t know where he came from, and we have only the thinnest understanding of his mission. When you play such a creature do you formulate a backstory and attitude in your head? Who, as far as you’re concerned, is the Engineer? IW: Someone on the crew, (I forget exactly who) described them absolutely perfectly as “Truck drivers of the apocalypse!” They serve a higher power/intelligence, unnamed and unknown. V: This time you ripped Michael Fassbender’s head off, bludgeoned Guy Pierce, and hounded Noomi Rapace – can you comment on working with these actors? IW: The first time I saw Fassbender on set it was a 20 second masterclass in knowing your character. Quite amazing! Everyone was thoroughly charming, I only met Guy Pierce on the day that we shot the awakening scene. Whilst we were between shots, we stayed on the set chatting. When someone asked me if I would step away for costume checks an hour had passed, almost in the blink of an eye. On set we only ever saw each other in makeup, so we had an agreement to meet at the premier party, so we could see each other up close, in person! V: Ridley has a reputation for being a perfectionist and artist. Were you given any leeway in your interpretation of the Engineer, or were you directed more closely by Scott? IW: I had a rudimentary framework of concepts that I knew would need to be employed; his superiority, almost regal posturing, but generally I was free to explore the character. The first time we see the Engineer rise from his hibernation sleep, I just went for it and the scene sort of grew organically. A hush fell over the set after cut was called on the first take and we all looked at each other as if we’d done something wrong. Gradually the crew went about their tasks and a friend of mine on the makeup team came over and said “Ridley’s coming over.” I thought “oh! what have I done?” I had nothing to worry about, he was very pleased. 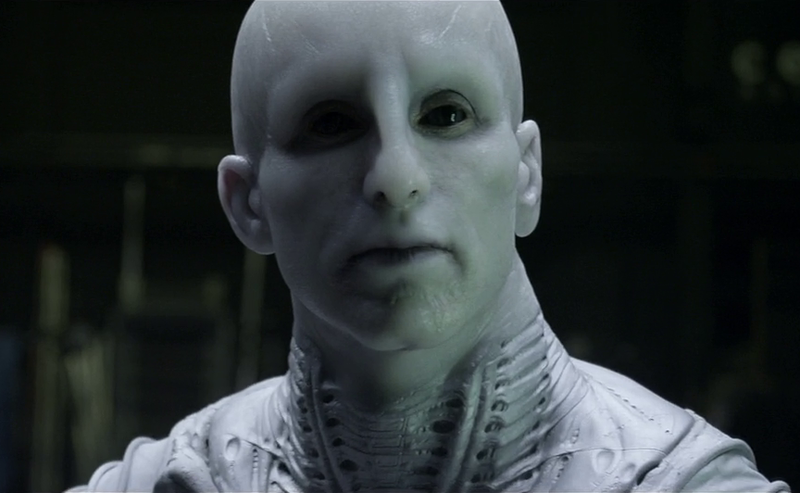 Ian Whyte serving a higher power in Prometheus. 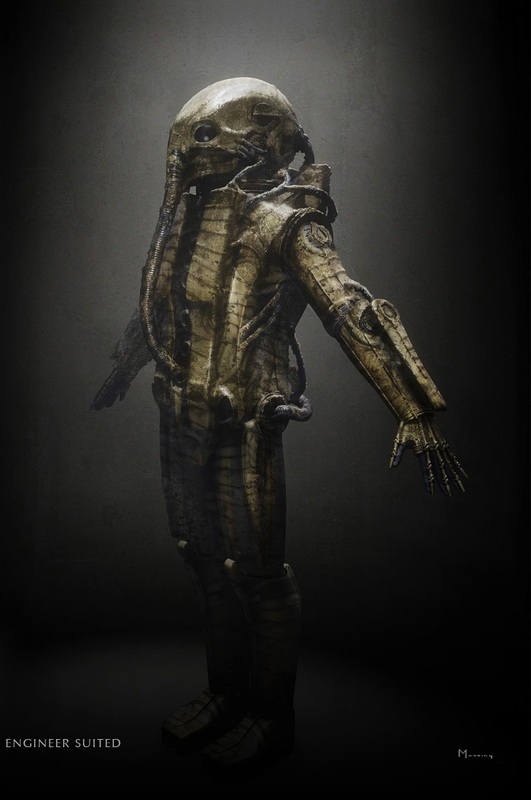 V: Fans have been waiting for decades to see the Space Jockey come to life and pilot his ship. How did it feel to don that suit and helmet and sit at the controls in that very impressive set? IW: This was an idea in Ridley Scott’s head for 32 years. 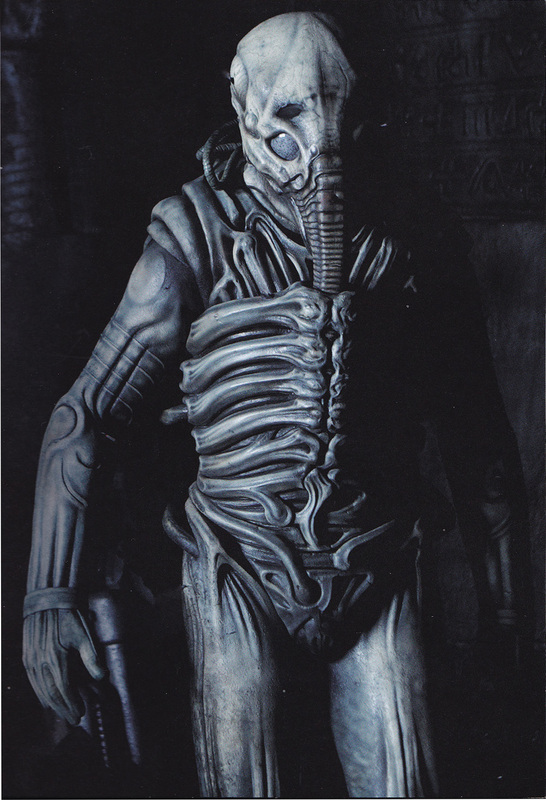 Ever since we first saw the pilot in the derelict ship in Alien, questions have been asked as to who this being is. It was an honour and a privilege to finally bring it to life. V: You’ve also been busy with various roles on Game of Thrones. First as a White Walker, then Gregor Clegane, and also as a giant. Can you tell me about working on the series and your multiple roles? IW: George R R Martin has created a vast stage for actors, I would have been happy to just play one role, but to have the opportunity to play multiple parts is a joy and a privilege. They will all die of course! V: Your role as Gregor Clegane was probably your most human to date (though the Mountain is no less of a monster). Was accepting the role a daunting prospect for you? IW: It was very daunting not least because I am not the first person to play the part and I came under quite a lot of criticism, not for my performance, but for daring to take over the part in the first place. Oh well! Criticism is all part of the job. You have to be professional about this sort of thing and do what you think is right. It was almost a different character from series one, no action at all, just a vile presence, a cauldron of simmering rage. V: You also shared some screentime with Charles Dance, who is also an Alien veteran, having played a prominent role in Alien 3. Can you comment on working with Dance in the show, and your scenes together? IW: Oddly enough, it never occurred to me that he was in Alien 3 until we did a personal appearance together for a fan convention in Belgium and he was asked questions about his career. He is a gent of the highest order and a joy to work alongside. After meeting for the first time I quite forgot that he has been quite an inspiration to me throughout his career and we just got on with doing the scenes. I found playing this character in these particular scenes quite paradoxical. This is a man who is infamous for his brutality, his inhumanity and his angry rages, but in Tywin’s office he is as if a naughty schoolboy standing in front of the headmaster… I found it a delicate balancing act. V: You have appeared in every season of GoT to date, either as a monster, Clegane, or a giant. Without giving anything away, can we expect to see you again for series 4? As someone who’s read the books, the Mountain has some very front-and-centre scenes coming up. IW: Wouldn’t it be great if I could give you a scoop? No! quite simply, NO! no details of series 4 shall pass from my lips! sorry! 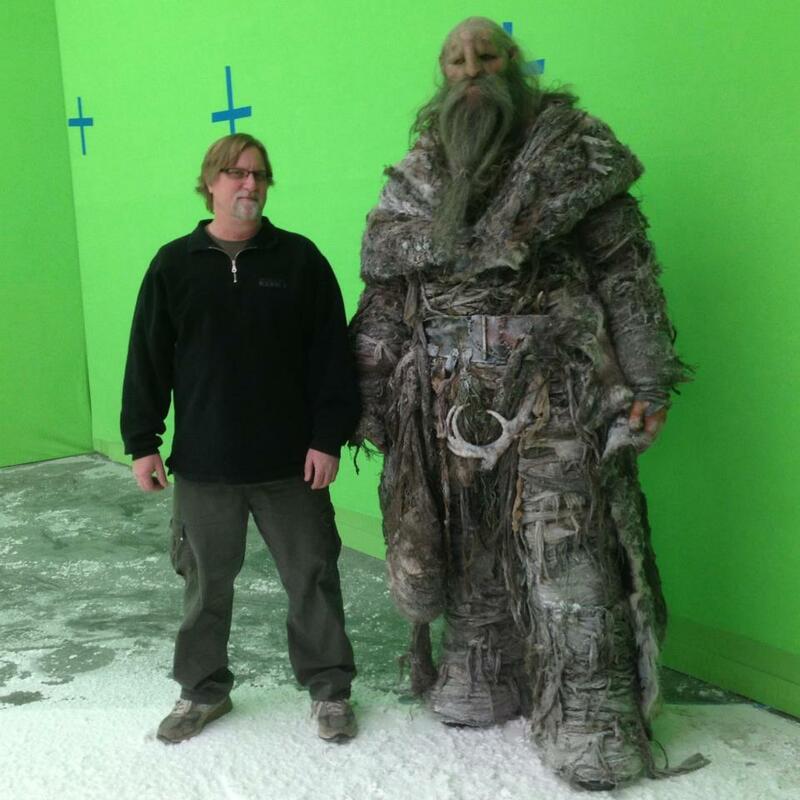 Ian in costume as a giant from Game of Thrones. I’d like to thank Mr. Whyte for taking the time out of a hectic schedule to answer my long winded questions. It was nothing but a joy and I look forward to seeing more of his gods and monsters! I have to extend another thank you to Space Sweeper for crafting the article’s banner, so – thank you!